this day in crime history: april 13, 1934 | Nobody Move! We're here for your money. Cooperate, and nobody gets hurt. 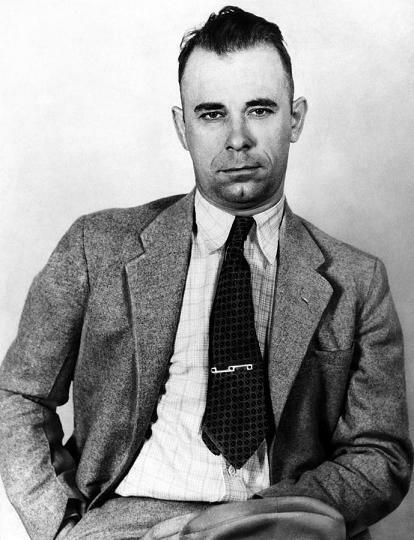 On this day in 1934, outlaws John Dillinger and Homer Van Meter went shopping for guns in Warsaw, Indiana. Their shopping expedition began in the early morning hours of April 13th, when they assaulted Warsaw Police Officer Judd Pittenger while he walked his nightly beat. The two outlaws forced Pittenger to accompany them to the police station, where they stole two pistols and some bullet-proof vests. No background check was performed when the two bank robbers acquired their guns. This was due to the fact that in 1934, there was no law requiring criminals to pass a background check before stealing guns. To this day, no such law exists. I LOVE the way you describe this action…lol. It also makes the case that criminals SHOULD have to undergo a background check…BEFORE they get denied the purchase of ANY legal firearm. Add insult to inure in this instance. (yeah, that black market doesn’t follow the law, so nothing will change there).